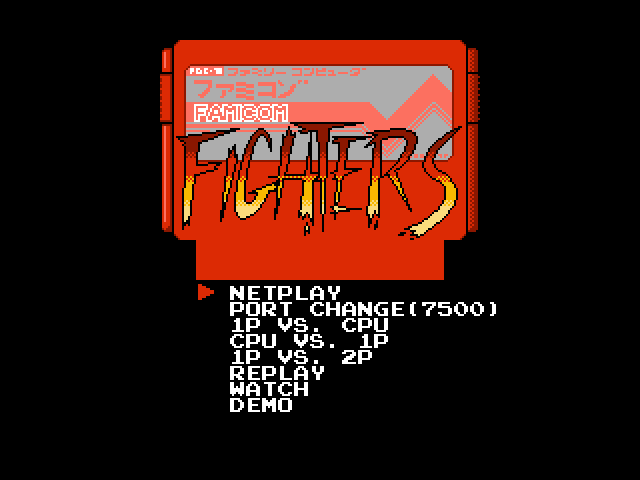 Based on the latest Famicom Fighters build, here is the IKEMEN edition! -Hard knockdowns use a different sfx. -New stage: Factory from Mighty Final Fight. -All characters now use the EXPLODsive buffering system by JustNoPoint and Jmorphman. This fixes issues with what MUGEN's default command system had. ---Allows them to charge during hitpauses. -All characters can summon in mid-air now. Holding down while hitting Select will allow you to summon the crouch variant of the helper. -Helpers can be summoned mid-attack. This costs double the helper meter requirement however and summons that require a full bar can't be used. --Air attacks that have the player float will make the player complete the action before they become grounded. -Chip damage has been increased, going from 1/10th of the original damage to 1/4th. -All air attacks now do the same hitstun on grounded opponents. -All characters have pre-jump invinicbility. -Hitboxes have been readjusted for certain basic animations (walking, jumping, dashing, getting hit) to be more consistent. -Hitpauses have been extended a bit. -Mario is now taller and is the same size as his original Super Mario sprites. -Now has color separation. 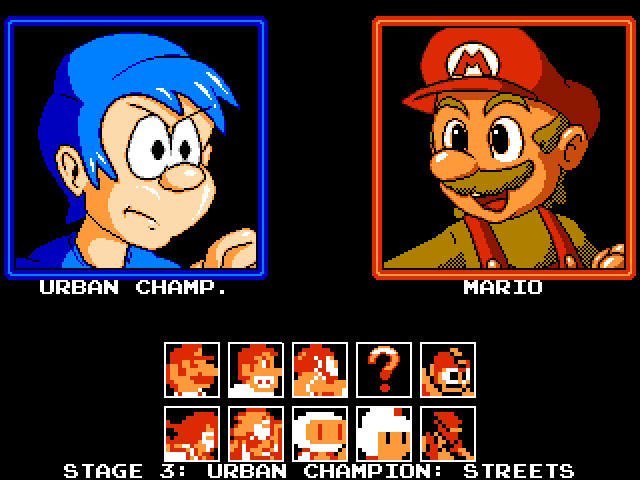 Some of his palettes have been changed as well to change Mario's details. 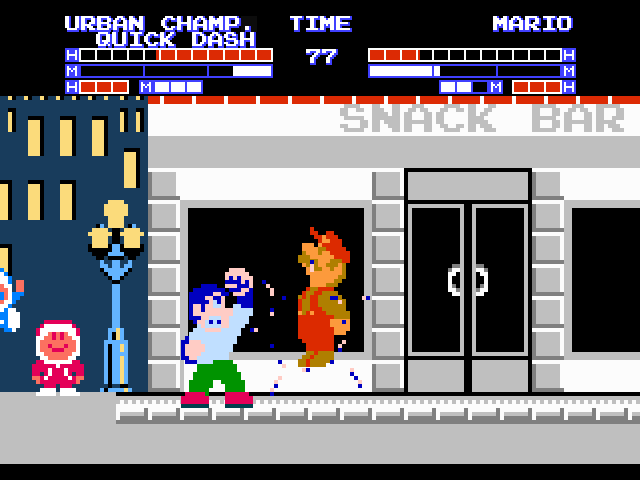 -Plumber's Punch and Brick Breaker use new animations. -Plumber's Punch is now +8 on hit (from +10) and 0 on block (from -2). -Brick Breaker's range is slightly nerfed (Mario doesn't slide anymore), is now -16 on block (from -15). The damage now remains the same when his arm is fully extended out and he launches airborne opponents slightly higher. -Punch version of Flame Launch launches the fireball at a steeper, longer angle. -Urban Champion is now a bit taller and his hitboxes have been altered to match this. -Sprites have been color-seperated now. -A bunch of animations have been updated to look better. -Readjusted Urban Champion's jump speeds. -Crouching Light Kick and Crouching Strong Kick now have more range. -Kick Version of Quick Dash now has upper and mid-body invincibility. -Counter Attack now has two variations and an EX version. Punch version has a faster startup but the invinicbility only lasts during the back step. Kick version is the same but with more damage. EX version is slightly longer than the kick version but causes a wall bounce on hit. during Counter Attack has been reverted. -Flowerpot now has proper block stun and its arc changes based on the opponent's own height. -Scapegoat has gained more active frames and dropped some recovery frames. opponent forwards. After throwing, Balloon Fighter will attempt to fly away as fast as he can. counting towards the juggle counter. -Standing and Jumping hitbox corrected. increased (4F -> 6F). Now +4 on hit/-2 on block (formerly +7 on hit/+1 on block). hit/2 on block (formerly +3 on hit/-2 on block). -All air attacks do the same hitstun to grounded opponents as Jumping Light Punch. ability to chain into Jumping Strong Punch. and the active frames were decreased (8F -> 5F). -Jumping Light Kick hitbox was changed so the collision covers his whole knees. -Body Splash's hitbox was increased from behind but decreased from the front. be cancelled into Meteor Crash. -Knee Landing startup startup increased (16F -> 22F) but travels a bit farther and can cross-up. -Sommersault Kick range increased, separates the opponent farther and does less damage. -Shooting Slam falls faster now. -EX Shooting Slam shoots Star Man higher up and travels less distance. -Nova Whip's startup was decreased (8F -> 6F), throw range was nerfed. is dropped if summoned mid-attack), then falling down in front of where Star Man set up the summon. Damage was nerfed (150 -> 120) and he puts the opponent in an invulnerable knockdown. comes out, there's a bit of waiting time (12 frames) before he's ready to swing. -Air Metal Blade and Shadow Blade have a longer startup (9F to 12F) and decreased knockback. Air Metal Blade also has less hitstun. -Level 3 has been changed a bit to look better and was recoded to prevent Mega Man or the opponent getting stuck in certain conditions. -Holy River damage has been buffed. (230 to 270). Fixed an issue where Holy Flame could potentially hit more than once. --Medusas come out and travel much faster. --Airborne opponents get knocked slightly higher. --Unaffected by damage dampener and juggle counter. -Hard Hammer (Air Strong Punch) can now be performed by holding back and pressing Punch as well. The opponent also doesn't move as far if they get hit airborne. -EX Earth Smasher has been changed a bit. -Fygar now hops in for his standing summon. -Mappy now jumps in for both summons. -Mappy's Trampoline is now guaradble if it makes contact while you're blocking. -Back Dash makes Thonolan preform a higher jump and thus, recover longer. attacks while making pre-existing links easier. -Crouching Light Punch's startup has been decreased by 2 frames (8F ->6F) and has less pushback. -Crouching Strong Punch's pushback was increased. different hitbox that hits lower. -Jumping Light Kick hitbox was extended downwards. -Jumping Strong Kick's range was increased a bit. -Punch version of Rising Flip has Thonolan doing a single flip kick while rising off the ground. -Sky High Kick has all-around invinicbility during the first 12 frames. -Rat Knight jumps towards Thonolan's position before marching forwards. -Bub's rainbow disappears after hitting once and puts the opponent in an invulnerable knockdown. -NOVA's boomerang doesn't knock down but hits once on the way forwards and again on the way back. -NOVA's grenade will shorten its distance based on how close NOVA is close to the corner. -Rygar's crossbow now flings the opponent lower. Damn, that's a pretty large update. I've been meaning to mess with this game for some time anyways, awesome job fam. You really should Fclass, it truly feels like something that would release at the time. -Fixed a bug where Urban Champion could cause the opponent to die twice if he defeated them with EX Counter Attack. -He got his name back. -Fixed an issue where Mine Lay was on the wrong button. -Fixed hitsparks involving Amazon's Outlaw Choke with Samus and Mega Man. -Fixed an issue where Star Man can go into his followups during Rocket Run if he made contact. -Fixed Charge Kick's move variants being set to the wrong buttons. -Fixed an issue with Butterfly Kick where it would come out during any down motion and not specifically down-back. -Fixed a bug where Earth Shatter's ranges weren't applied correctly. Thanks for sharing. Your game is excellent.